At the Killino Firm, our motorcycle accident lawyers are biker friendly and fight aggressively on behalf of motorcyclists who are injured as a result of another person’s reckless and dangerous driving. From crushed bones and lost limbs to paralysis and death, we understand the magnitude of the potential injuries incurred by motorcyclists. If you or a loved one has been injured in a motorcycle accident and you are seeking an experienced and aggressive motorcycle attorney, contact the Killino Firm today. Our injury lawyers serve as tireless advocates for victims of motorcycle crashes and will help you and your family deal with the insurance companies and recover the maximum compensation you are entitled to. At the Killino Firm, we know the laws governing motorcycle crashes. We also know that the injuries sustained in a motorcycle crash can be devastating and catastrophic. Our motorcycle crash attorneys have recovered millions of dollars in compensation for our clients because we are committed to ensuring they receive the full amount of compensation they are entitled to, not a fraction. 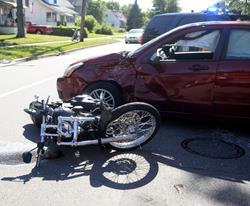 In many cases, bikers are the victims of other drivers’ reckless and dangerous behavior. They are victims of drunk drivers who are not paying attention to the road, or are unable to react. At the Killino Firm, no matter what the circumstances of your case, we will find out what happened and make sure that the responsible person is held accountable. Not only will we hold them liable, we will also make sure that you receive the maximum amount of compensation you deserve. If you or a loved one has suffered an injury in a motorcycle crash and you have not contacted an attorney, you should call The Killino Firm now. We will thoroughly investigate the details of your unique case and fight tirelessly on your behalf. Don’t wait any longer. Call our lawyers today and experience the Killino Firm Difference.